David Hogue was born and raised in Fayetteville, Arkansas. He attended the University of Arkansas School of Law and worked as a deputy prosecuting attorney here in Washington County after obtaining he law license in 2009. 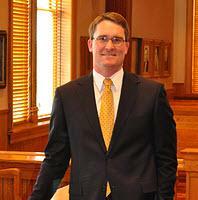 In 2011 he established the Hogue Law Firm, PLLC, where he focuses primarily on criminal defense work. As a criminal defense attorney David has represented clients accused of everything from DWI to Attempted Murder. He has tried numerous jury trials in Northwest Arkansas and will aggressively represent his clients as they navigate the criminal justice system.